I’ve been off-balance all week. It started with an overly busy weekend and being short on sleep, then got complicated by my husband’s sudden illness. The doctor warned us Kurt could wind up in the hospital. We spent one tense night waiting to see if the antibiotics they gave him would result in enough improvement to keep him out of the ER. Fortunately, the drugs finally kicked in. Kurt’s still sick, but feeling much better, and recovering at home. Despite the distractions, I’ve been trying to write. Trying means exactly what you think: failing. But I keep coming back, putting in the time in the hopes that I will make at least a little progress. I’m tempted to lose myself completely in the distractions life is throwing my way and the soporific summer heat. Hobbits want a second breakfast; I want to hibernate twice a year — winter and summer. Life feels like a lot of urgent chores right at the moment and balance is nowhere in sight. This morning, I realized just how overwhelmed I’m feeling. We woke up to no internet. It started working again before I had a chance to call our service, and my relief was monumental. They say “don’t sweat the small stuff”, but the small stuff can feel enormous. I want to believe that I can achieve balance, that there are enough hours in the day for work and play, chores and rest, with plenty left over for creating and dreaming. 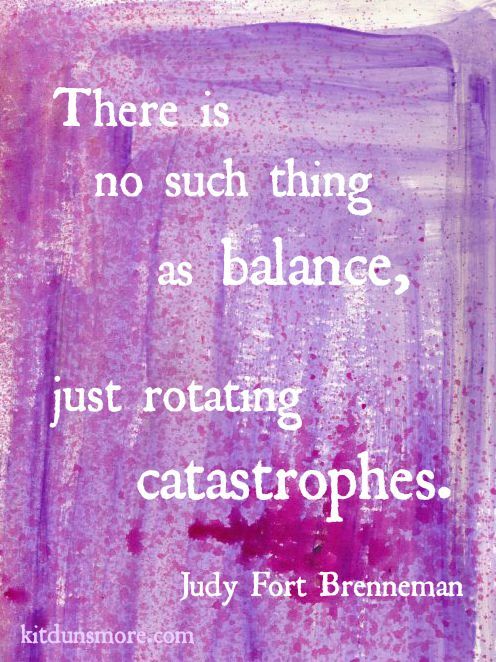 But most days are not balanced. Something dominates my day, becomes the focus, eats up my time, energy, and attention. The only semblance of balance I can get is across weeks or months, and the way I get a novel written despite life’s recurring catastrophes is by writing for at least for a few minutes no matter what’s going on. How honest of you to post this! Did it help to write it down? Sometimes when I am feeling overwhelmed I need to get it out of my head and onto paper. That helps to clarify things for me. I admire you for finding ANY time to write! It helped a little. It would help more if my husband were feeling better. Unfortunately, he’s still sick and things are uncertain. My writing time is definitely limited right now. As my friends have reminded me, there are times when other things have to take precedence. I will write again when I can. Oh Kit…..I am sending you good wishes. As someone once said, “The only time I see the middle of the road is when I’m passing it”. Same for balance. Most of the time I find I simply must stop thinking about what I want to do and do what’s in front of me. At other times I find I must change what’s in front of me. I love your writing Kit. Hope Kurt is feeling better. I love the “middle of the road” saying! And thanks for your kind words. Kurt is still sick but we hope he is over the worst of it.